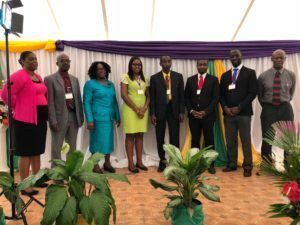 Delegates at the Second Quadrennial Session of the North East Jamaica Conference of Seventh-day Adventists (NEJC) voted a new team of Officers, Department Directors and Executive Committee to carry out the administrative functions of the Conference for the next four years. 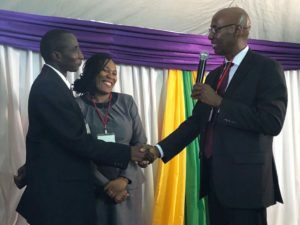 Pastor Everett Brown (right), president of the Seventh-day Adventist Church in Jamaica congratulates Pastor Adlai Blythe are he was elected president of the North East Jamaica Conference (NEJC) during the Conference’s Second Quadrennial Session held at Camp Don in St. Mary from August 20-21, 2018. The Directors for Publishing and Health Ministries will be appointed by the Executive Committee of the Conference at its first sitting. 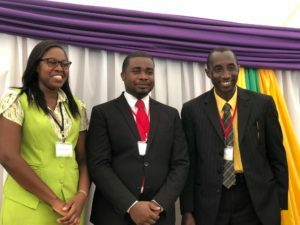 The Installation Service for the newly elected administration will be held at the Seventh-day Adventist Church, in Port Maria, St. Mary, on Sabbath, September 8, 2018, starting at 4:00 p.m.
Officers of the NEJC (L-R) Miss Sasheena Thompson, Treasurer; Pastor Danielo Daniels, Executive Secretary and Pastor Adlai Blythe, President. 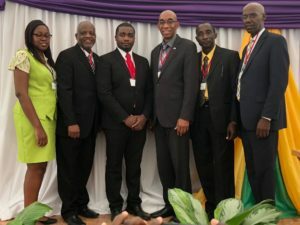 The new NEJC Administrators pose for the camera with administrators of the Jamaica Union Conference Pastors: Bancroft Barwise, Meric Walker and Everett Brown. The newly elected Officers and Directors of NEJC.